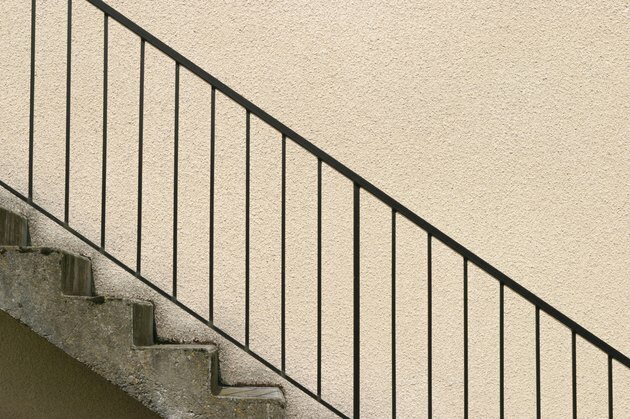 Along with requiring specific standards for items like lighting, tread width and steepness, Minnesota building codes require handrails on stairways to be a specific heighth. This is mandated for safety reasons and is checked by housing inspectors in the municipalities that enforce the state building code. The idea behind the height requirement is to prevent people from accidently falling off the edge of a staircase. Minnesota building codes require stair railings to be a specific height for safety purposes. The building code requires the top of the handrail to be no less than 34 inches in heighth from the top of the stair treads. In some municipalities, the maximum heighth is 38 inches, to ensure that shorter people have the ability to hold on to the handrail while they're ascending or descending the stairs. Handrails are required to be in place for the full length of the stairway, beginning at a point above the first step and continuing to the top of the stairway. In addition to handrails for stairways, Minnesota building codes decree that all decks that are 30 inches above ground have handrails that are a minimum of 36 inches above the primary surface of the deck.